Mega Sale! Save 24% on the Gallery of Light Flower Holder Wall Sconce, Modern Rustic Wall Sconce Candle Holder by Gallery of Light at Home Decor Outlet Store. MPN: 6C-463C-FEEC. Hurry! Limited time offer. Offer valid only while supplies last. Place the candles of your choice inside this modern wall sconce candle holder and enjoy the magical shine. candle not included. Beautiful silver metal stems spring from your wall, holding gorgeous faceted glass candle cup blooms and glimmering buds. The light from a single candle can be a work of art with this unique decorative metal wall candle sconce! Brilliant shine and fantastic design is not all you\'ll get from this flower candle sconces wall decor - you\'ll also get plenty of compliments! 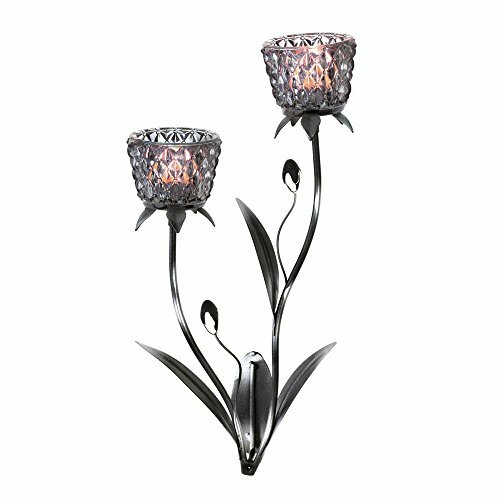 Weight of this flower wall sconce candle holders:1.4 pounds; dimensions:7.25" x 3.5" x 14"